This rock crystal cluster nearly spans the quartz collectible roster - doubly-terminated crystals? check. A rare to locality little needle crystal, elestial crystal? check. Rare curved crystal? check. 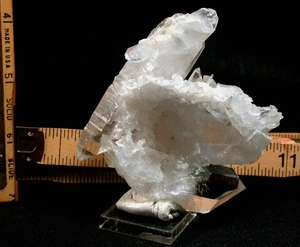 A super clear extremely rare 8h faced crystal, luminous veils, natural etching, penetrators? check. Rainbows, record keepers, a translucent after-calcite 1/2"x 2"x 2" geometrically incised pocket??? check. 1-1/4"x 3"x 3-1/4", with the largest doubly-terminated crystal at 1"x 1" x3", this is a [small] cabinet size cluster with infinite potential for two-way healing, holding nuts on your desk...minimal extraction damage [to it and the nuts].